Change is an inherent feature of all aspects of language, and syntax is no exception. While the synchronic study of syntax allows us to make discoveries about the nature of syntactic structure, the study of historical syntax offers even greater possibilities. Over recent decades, the study of historical syntax has proven to be a powerful scientific tool of enquiry with which to challenge and reassess hypotheses and ideas about the nature of syntactic structure which go beyond the observed limits of the study of the synchronic syntax of individual languages or language families. 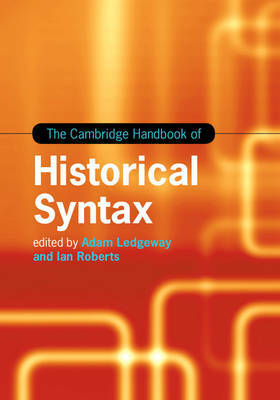 In this timely Handbook, the editors bring together the best of recent international scholarship on historical syntax. Each chapter is focused on a theme rather than an individual language, allowing readers to discover how systematic descriptions of historical data can profitably inform and challenge highly diverse sets of theoretical assumptions.